Services we offer include treatment of Hand and Wrist ailments using both surgical and non-surgical methods. We accept a variety of insurance coverage and offer several forms of payment, including cash, and credit cards. We are affiliated with many hospitals in the Greater Houston Area, specifically, the West and North West corridor. To providing both friendly and professional services to patients. Hand Surgeon Dr. Nicholas Fiore is board certified by the American Board of Surgery in both surgery and hand surgery. Dr. Fiore initially developed his interest in hand surgery after fracturing his wrist while wrestling for the Duke University Blue Devils. Due to the injury, Hand Specialist Nicholas was forced to undergo surgery and placed in a cast for several weeks. During this time he truly recognized the profound impact of a hand injury on a person’s physical, emotional, and financial well being. Dr. Fiore’s resolve was strengthened and after obtaining his medical degree from Ross University School of Medicine he entered general surgery residency at the University of Medicine and Dentistry-NJ Medical School. During his residency he achieved, both local and national, recognition in his ability to teach (see curriculum vitae). His practice is solely dedicated to surgery of the upper extremity with a focus on pathology of the hand and wrist. In addition to his busy clinical practice, Dr. Fiore is a speaker for Auxilium Pharmaceuticals and a medical technology consultant. We are equipped to treat a wide range of common hand and wrist ailments, cysts, and more. We treat a variety of issues such as carpal tunnel, sports injuries, tendon injuries, arthritis, fractures, and trigger fingers. We have an in-house occupational therapist for patients requiring rehabilitation. Dr. Fiore specializes in the diagnosis and treatment of Hand, Wrist, and Elbow ailments, including Carpal Tunnel, Golfer’s Elbow and Tennis Elbow. 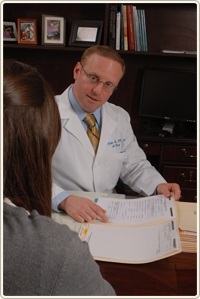 He is board certified by the American Board of Surgery and fellowship trained in hand and microsurgery. For more information on treatment options, or to schedule a consultation, call Fiore Hand and Wrist at (281) 970-8002.